Top Five Duties of New/Used Car Sales Consultant | Job Awareness: Know about Jobs and Job Descriptions. 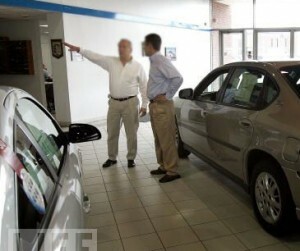 This is a job for those people who are strong at verbal and non verbal skills, this job does not require a special qualification, but many automotive companies rely on this sales consultant to sell the car which is kept on the showroom. Following are the duties of a New/ Used Car salesconsultant. Understanding the features of the car doesn’t matter whether it is New or old, should have the ability to grasp the features of a Particular Car model and should remember and explain all the features to the prospective customers who ask about the model or directly come to the showroom to look at the car. Should always have in hand competitive analysis of other car, most be well verse in knowing other competitive cars, explain what is the superiority through comparison and convert more sales. Warm welcome to the customers when they come to the showroom and create strong customer friendly relationship with the customers. Understanding what the buyer wants and present the Car model according to customer ‘s taste and preferences, some customers like a black color car with some of the features, a Car sales consultant should be able to suggest Car models according to the taste and preference of the customer. Attend all the training programs conducted by the company, Note all the points , features, capabilities of each car model, memorize it and close the sales effectively. These are the top five duties of a New/Old car sales consultant. Just a bachelor’s degree is enough to do this job and at least 1 to 2 years of prior selling experience is necessary for this job.